Writing the biographies of politicians or generals requires no special language; the biographies of writers can, without much more difficulty, be laid out with extracts from their writings to illustrate their style or their faults. The biographies of artists pose a greater difficulty, but the reproduction of a painting or photograph will do the work a thousand words cannot. However, writing the biography of a composer places the biographer in a much more difficult position. Musical samples can, like illustrations, be reproduced in the text (as in Jan Swafford's Johannes Brahms: A Biography), but no large body of readers is going to be able to decipher them on sight. Yet if the biographer skips the musical technicalities and concentrates on writing a life-and-times (as in Howard Pollack's Marc Blitzstein: His Life, His Work, His World), then the gift which made the subject worth writing about in the first place fades into an impenetrable mist. 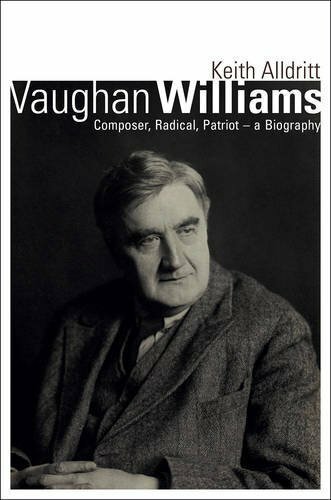 Keith Alldritt's Vaughan Williams: Composer, Radical, Patriot—A Biography falls into the second category of musical biography, along with many of the drawbacks that accompany it. Alldritt is, by trade, a novelist and a biographer of statesmen (Churchill, Roosevelt) and modern British writers (Orwell, Lawrence, Yeats, Eliot), with only one slim musical title to his credit, Elgar on the Journey to Hanley (a romance about Elgar and Dora Penny, the 'Dorabella' of the Enigma Variations). From this unpromising platform, Alldritt finds himself tackling Ralph Vaughan Williams, whom many revere as the greatest name in British music in the 20th century, and upon whom equal numbers have bestowed the pitying glance and heavy sigh, as though he were a provincial musical handy-man capable only of writing 'cow-pat music.' As if this were not intimidating enough, Alldritt's is the first full-scale biography of Vaughan Williams to be attempted since the re-tooling of Michael Kennedy's The Works of Ralph Vaughan Williams in 1980, and, more to the point, since Hugh Cobbe's enormous collection of Letters of Ralph Vaughan Williams, 1895-1958 (2008) and the death of the composer's second wife, Ursula, in 2007, who had ditched a deep moat around her husband's life. But even in the face of these challenges, Alldritt does a fine job of breathing readable life into the man he lauds for having "musicalized a very long historical tract of English experience and feeling." Born in 1872 in the Cotswold village of Down Ampney, Ralph Vaughan Williams was a son of the vicarage: his father, Arthur Vaughan Williams, was rector of All Saints Church and an Oxford man who had drunk deeply of John Henry Newman's Tracts for the Times. But the Vaughan Williams family connections extended far beyond the parish hedgerows. His grandfather, Judge Edward Vaughan Williams, was the author of the long-standing Treatise on the Law of Executors and Administrators, married into the landed gentry, and was knighted by Queen Victoria. Moreover, Edward Vaughan Williams had befriended Henry Hart Milman (dean of St. Paul's), Henry George Liddell (co-author of the Liddell and Scott's Greek-English lexicon) and Richard Chenevix Trench (Dean of Westminster Abbey and later the Church of Ireland's Archbishop of Dublin), so it is no surprise that two of the judge's sons went into the Church. What is surprising is that Arthur Vaughan Williams took as his wife Margaret Susan Wedgwood. Surprising, because the Wedgwoods were not only the fabulously wealthy offspring of the famous pottery-maker and Non-Conformist, Josiah Wedgwood, but were entwined by intermarriage to the Darwins. Ralph Vaughan Williams' grandmother, who had married the second Josiah Wedgwood, was Charles Darwin's sister. That should have marked Ralph Vaughan Williams from his cradle as bound, like his older brother Hervey, for the bench or the Civil Service, or for a quiet life of rural pottering-about. Instead, in 1890, he announced that he wanted to become an orchestral musician (specifically, a violist). As Alldritt wickedly puts it, his family, "so well placed in London society, would surely have considered viola playing to be no career for a gentleman," and his Darwin cousins laughed that "he can't play the simplest thing decently." But Vaughan Williams was convinced he "should have made quite a decent fiddler," and he talked the family into letting him study for a year at the Royal College of Music under the genial Charles Hubert Parry, who taught the 18-year-old composition. The RCM left a deep mark on Vaughan Williams, and not only because Parry was a beloved teacher. Founded in 1882 with Sir George Grove as principal, the RCM breathed the atmosphere of a practical, almost working-class academy for minting orchestral musicians. "Write choral music as befits an Englishman and a democrat," Parry advised him, and the advice guided Vaughan Williams in both respects for the rest of his life. Still, one year was all he was granted before the firm familial hand at the back steered him to a more conventional university career at Trinity College, Cambridge, where he graduated with a BA in history. But Cambridge did little to rinse the RCM out of his system, and in 1895, Vaughan Williams truculently returned to the RCM, now to study composition under Charles Villiers Stanford and to meet his fellow-spirit, Gustav Holst. Two years later, he was off to Berlin to take advanced lessons in composition under Max Bruch, and in 1898 he wrote out his first essays in large-scale composition—two quintets, a song cycle, a serenade, a Bucolic Suite, and a Heroic Elegy and Triumphal Epilogue.